The news of the attempted assassination of Prince Alfred arrives at the Thames via the Enterprise. There is a universal feeling of horror and angry curses against the assassin are uttered. There are also exclamations of deep sympathy for the Prince, and fervent hopes that the report may prove unfounded. Robert Graham has leased from the Thames Maori a large tract of valuable land at Waiotahi, which they request to be called Grahamstown. This has been a matter of considerable delicacy and difficulty as the land was owned by so many different tribes and families. Earlier this year the owners of the reserve between Tookey’s Flat and Shortland asked Mr Mackay to arrange a survey of it so as to lease it for town allotments. Mackay took the preliminary steps and has now sanctioned the lease to Robert Graham. Spey for Tapu Creek with 3,600 ft timber, 18 sheep, 13 bags potatoes, two cases biscuit, four cases spirits, three kegs spirits, five cases beer, one case gin, two cases sundries, five packages sundries, four packages soda water, 3,000 shingles, six bags flour, one parcel tobacco. The little steamer Clyde which has been for several days on the flats at Shortland arrives in Auckland harbour this evening bringing 1200 ozs gold and 40 passengers. Now that Robert Graham’s title to the larger portion of the flat between the Karaka and Waiotahi Creeks is confirmed the town of Shortland is being extended in that direction and it is thought soon Pollen Street will rival Auckland’s Queen Street in length if not in grandeur. It will be continued in a straight line until it reaches the base of the range at the Waiotahi, then at an angle of about 30 degrees to the creek. Other streets are also being laid out, and Mr Davy, surveyor, is busily employed. Mr Graham has a number of men working on buildings, fencing, draining, ditching, and ploughing. Mr Mackay has also made application for permission to form a tramway between Shortland Town and Grahamstown, also a wharf at each end of the townships which will be a great convenience to the inhabitants of the goldfield. 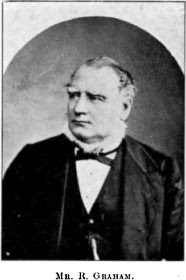 About 100 Maori now meet at Mr Mackay’s residence and after a korero of about four hours duration, Mr Mackay states that, as the land appears to him to be satisfactorily leased to Mr Graham, he wishes only to retain to himself the right of laying the streets through the land. Mr Mackay also says that he sees no difficulty in its easily passing through the Native Land Court and suggests a plan whereby the surveys of the several lots might be arranged. A schooner rigged paddle wheel steamer, built expressly for the Thames trade, is launched from the ship building yards in Custom-house-street West, Auckland, this morning. Rapid building progress has been made on this large and handsome steamer. Now her stocks are knocked asunder and the vessel is launched into the water with complete success, amidst the cheers of spectators. As she leaves the stocks and slowly glides into the waters of the Waitemata she is named the Duke of Edinburgh by Miss Isabella, eldest daughter of the ship builder Mr Duthie. The material used in her construction is some of the very best including kauri, cedar and pohutakawa. Her unusually light draught of water makes her eminently suitable for the Thames trade and she has been adapted to creek service at Shortland Town. Trial borings for a wharf at the Waiotahi begin - at 30 ft the bottom is not reached. This looks promising for shipping accommodation in Tookey Town. The claim holders on the Waiotahi now feel a great need for a road up that creek and hold a meeting today at the Break O Day claim regarding the construction of a good and durable roadway. It starts pouring rain in buckets-full turning the streets of the Thames to slush again. At Tapu there is a decided improvement in the state of affairs of both mining and business. The creek has assumed an air of importance which surprises even the oldest inhabitant. Speculation in shares has commenced in earnest. The quantity of quartz now on the ground waiting for crushing is something enormous. There have been several rushes lately and the diggers appear most contented – all in good spirits, and expecting to make a 'pile'. The various stores at the creek are doing well with new stores still going up. The great cry however is machinery, if proper machinery was on the ground Tapu would take its stand as the best goldfield in the Province of Auckland. Speculation in shares has commenced in earnest at Tapu Creek – the result of the Fern Flat rush. Avon to the Thames with 1 portable engine and crushing machine, 6 barrels beer, 2 tanks, 1 ton flour, 500 bricks, 1 pair bellows, 1 anvil, 20 packages. For the information of members of the Hebrew faith resident at the Thames or in the country districts, Passover holidays commence on Monday evening April 6 and end on Tuesday evening April 14. It starts raining and gathers in such intensity that men are asking if they ever saw heavier rain in their lives. Some have, but only in the tropics. With the rain comes half a hurricane of wind from the east north east. ‘Red Bill’, real name William Mathers, a man well-known at the Thames for the past few months and one of Tom Long’s party at Tapu Creek, vanishes into the stormy evening. The fury of the storm. It has poured down and blown all night and great damage has been done along the Karaka, Waiotahi and Moanataiari flats and also in the lower workings of all the creeks. All who attempt to reach the flats this morning have to return, it being quite impossible to cross the Karaka creek, owing to both the volume of water coming down and the strength of the current. Gibbons waterwheel is damaged, another waterwheel has been washed away, the Half Moon claim loses £2,000 worth of quartz, Goodall loses 30 tons of coal, the Parnell Claim loses all their stacked quartz, and the Thames Quartz Crushing Company is in great danger but so far no damage has been done. The flood has done substantial harm to many of the claims on several creeks. The streets are almost impassable, being all but knee deep in mud. A woman with an eleven day old infant in her arms has been exposed since 12 last night to the fury of the storm. Mr Giles, butcher of Pollen Street, drives his horse and cart towards the flat, but in attempting to cross the Karaka stream the current is so strong it upsets the cart with its contents– Mr Giles and a half a side of beef. Mr Giles is with difficulty rescued; the side of beef is washed out to sea. His horse and cart are supposed carried out to sea also. Numbers of men were waiting until this morning to make a start for the new ground at Fern Tree Flat but the state of the weather makes this out of the question. Regardless of the weather the korero continues at Parawai between the Maori and Mr Mackay about lands leased. Some hundreds of men are present. A notice has been issued that leases of this land granted by the Maori will not be recognised by the government. Now it is asked by those who have taken leases in what position they stand, and if the leases are illegal, who will recoup the money paid to the Maori as purchase or rental. There are 14 canoe and whaleboat loads of Maori camped on the Eyre Street beach awaiting the decision. About 2,000 loaves of bread are consumed. The Maori Chief drags her anchor a few yards down the Kauaeranga Creek and the cutter Spray also drags her anchor and goes on to the mud flat. Fortunately they are not damaged. The Kauaeranga Creek is running at a rate of ten knots. The Midge was to have left at 11 this morning but postpones her sailing until 9 tonight. The intrepid NZ Herald correspondent tries to get up as far as the Waiotahi, but is unable to do so. In the Karaka Creek he sees the dead carcass of Mr Giles’ horse, putting paid to the story of it being swept out to sea. This is the only serious casualty he hears of. There is anger at the extent of the storm damage - those who have been at the Thames from the time of the arrival of the first cargo last winter have been predicting this all summer. Mr Mackay has had streets lined out during the last few months and it was expected that some measures would be adopted to metal Pollen and Grey Streets, if not other streets in the town. Nothing has, however, been done, Whether the work to be done belongs to the General Government or the Provincial Government or the Maori of the Thames is unclear. The Superintendent of Auckland sends Mr King, the Relieving Officer, to the Thames to communicate with the Digger’s Hospital committee who have requested assistance from the Provincial Government for bedding and other hospital appliances. 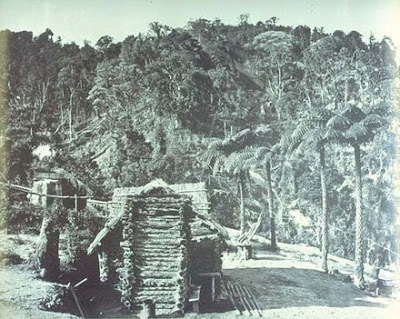 Father Nivard (secretary) and Charles F Mitchell (vice president) have been to Auckland to see the Superintendent and impress upon him the absolute necessity of some grant in aid towards the construction of a suitable building. They met with cordial good wishes, but the deputation is now assured that the Provincial Government has no money in hand, nor is it likely to have any to assist either building or endowing a hospital at the Thames. Spey for Tapu Creek with1 ½ tons flour, 1 ton potatoes, 400 ft timber, 4 hhds beer, 1 cask beer, 2 casks wine, 2 kegs brandy, 5 boxes candles, 1 chest tea, 5 casks beef, 4 packages ironmongery, 20 packages merchandise. Catherine for the Thames with 700 bricks, 60 bushels lime. Wahapu for the Thames with 700 bricks, 2 tons groceries. Clyde for the Thames with 300 ft timber, 1 anvil, 1 pair blacksmith's bellows and tools, 10 cases stout, 12 gunnies sugar, 1 ton iron. The Presbyterians, who muster very strong at the Thames, hold a meeting this evening and accept the tender of Mr Heron, for the erection of a Kirk, which is to be finished within one month from a date not specified. Prince Alfred Ernest Albert, Duke of Edinburgh, Earl of Kent and Earl of Ulster and second son of Queen Victoria, was on a world tour on the steam frigate HMS Galatea. The bullet, on striking the prince's back, glanced off his ribs, inflicting only a slight wound. The prince was nursed by the newly arrived Lady Superintendent of Sydney Hospital. Fern Flat or Fern Tree Flat would come to be known as Punga Flat.